Low-cost wrap-around protection with one-piece, polycarbonate lens. CE approved. Meets ANSI Z87.1 standards. Made with 100 percent virgin materials which improves the clarity of the material, as well as the strength. Features indirectly vented side temples to help keep the users cool; fit over most prescription eyewear to protect from impact. Used in applications such as power tool work sawing/drilling in metal or wood, hammering, painting or overhead work. Meet the high impact requirements of the American National Standards Institute's ANSI Z87.1-2010 standard. This flexible, stretchable strap is designed to keep glasses tight to the face without amy hanging leash and is compatible with most Edge Eyewear styles. Quilted nylon shell with fastener straps. Three layers of thick foam. Meets 16 CFR 1610, Class. Tough polycarbonate lenses for impact resistance; indirect vent ports prevent liquids from reaching eyes; protection against impact and paint spray, liquid splash, flying chips and dust particles. Meets ANSI Z87.1-2010 and OSHA regulations. Tough polycarbonate lenses for impact resistance; indirect vent ports prevent liquids from reaching eyes; protection against impact and paint spray, liquid splash, flying chips and dust particles. Meets ANSI Z87.1-2010 and OSHA regulations. Protects the wearer from both high impact and from chemical splashes; indirect venting allows the air to move through the goggles, helping to keep the wearer more comfortable while the vents help prevent liquids from getting directly to the eyes. Goggles can be worn over prescription glasses. The elastic goggle band helps customize the fit of these goggles to the users? head. Used in applications such as power tool work, sawing/drilling metal or wood, hammering, overhead work, applying pesticides or mixing liquid chemicals. Meets the high impact requirements of the American National Standards Institute's ANSI Z87.1-2010 standard. The blade-style Banraj has a lightweight, economical frame equipped with soft TPR nose pads and temple tips to create a comfortable, nonslip fit. This single-piece lens has no lower frame to obstruct sight. Edge Eyewear is ANSI Z87.1+2015 and Military Ballistic MCEPS GL-PD 10-12 compliant and all lenses block 99.9% of UV radiation. Stylish cat's-eye look, Tuff-Stuff scratch-resistant lens featuring built-in side impact protection and available with clear or gray tinted lens/frame. Built-in side impact. Complies with all applicable test requirements of ANSI Z87.1-2003. For use in reading project instructions, seeing detail sanding/cutting work or woodworking activities. Molded-in 2.0 diopter bifocal lenses are out of line of sight when not looking down. Soft molded-in rubber temples help keep glasses comfortably secure. Anti-fog lenses help maintain clear vision. Meets American National Standards Institute's ANSI Z87.1-2003 standard. Sleek and lightweight style. One-piece polycarbonate front with adjustable temples. Wrap-around protection. CSA approved available. Meets ANSI Z87.1 standards and base curve = 8. Sleek and lightweight style. One-piece polycarbonate front with adjustable temples. Wrap-around protection. CSA approved available. Meets ANSI Z87.1 standards and base curve = 8. Chemical splash goggle protects from dust, splash and fumes .060 polycarbonate lens. Vent holes on the brow guard help keep the user comfortable as does the adjustable temple length. The anti fog lens helps ensure that the wearer will have an unobstructed view when working in applications such as power tool work sawing/drilling in metal or wood, hammering or overhead work. Meets the high impact requirements of the American National Standards Institute's ANSI Z87.1-2010 standard. Sleek and lightweight style. One-piece polycarbonate front with adjustable temples. Wrap-around protection. CSA approved available. Meets ANSI Z87.1 standards and base curve = 8. Sleek and lightweight style. One-piece polycarbonate front with adjustable temples. Wrap-around protection. CSA approved available. Meets ANSI Z87.1 standards and base curve = 8. Sleek and lightweight style. One-piece polycarbonate front with adjustable temples. Wrap-around protection. CSA approved available. Meets ANSI Z87.1 standards and base curve = 8. Contemporary, lightweight and wraparound lens design provides distortion-free optic; provides 99.9% UV protection and is constructed of a polycarbonate, indoor/outdoor mirror lens. Meets ANSI Z87.1-2010. Lightweight; wraparound design; meets the requirements of ANSI Z87.1-2003. Lightweight glasses wrap closely to the head and flex to fit both large and small head sizes well. An anti-scratch lens coating reduces lens abrasion during normal usage. Meets American National Standards Institute's ANSI Z87.1-2003 standard. Pinlock allows easy size adjustment; four-point, fully adjustable nylon suspension; large, pillow-padded sweatband for extra comfort. TEKK Protection Hard Hat, Type 1, 4-Point Pinlock Suspension, Yellow, Class: Class G and E, ANSI Z89.1-2003, CSA Z94.1-2005 Wrap around lens contours to face for great fit. Soft, comfortable dual shot plastic/rubber temples for retention. Soft rubber nose pads reduces slippage on face. Used in power tool work, sawing, drilling and for protection from flying chips and debris. Use to replace broken or cracked faceshield covers; designed to fit the patented 3M TEKK protection deluxe and professional faceshield systems; made of a pre-molded clear polycarbonate; high in strength; meets the ANSI Z87.1-2009/CSA Z94.3-2005 requirements. High-impact polycarbonate clear visor; use with 895.9751. Tough, polycarbonate lens provides impact resistance with 10 base curve lens provides maximum coverage and protection. Rubber tipped temples provide a secure comfortable fit. Soft, rubber nosepiece provides non-slip, comfortable wear. Tough, polycarbonate lens provides impact resistance with 10 base curve lens provides maximum coverage and protection. Rubber tipped temples provide a secure comfortable fit. Soft, rubber nosepiece provides non-slip, comfortable wear. Lightweight glasses wrap closely to the head and flex to fit both large and small head sizes well. An anti-scratch lens coating reduces lens abrasion during normal usage. Meets American National Standards Institute's ANSI Z87.1-2003 standard. Features popular tinted and clear models; stylish and lightweight; meets requirements for OSHA and ANSI High Impact. Universal size allows it to fit inside any hard hat. Soft two-ply liner for extra warmth. Flame-resistant shell material. Adjustable hook and loop chinstrap. Hook and loop straps secure liner to hard hat suspension. Light weight frames that adjust by pulling on extend bar in frame; maximum UV protection and mirrored anti-fog lenses. Protects against projectiles & dust. Applications: Power tool work; Sawing/drilling metal or wood; Hammering; Overhead work. Light weight frames. Maximum UV protection and anti-fog lenses; protects against projectiles & dust. Applications: Power tool work; Sawing/drilling metal or wood; Hammering; Overhead work. Comfortable frame with mirrored lenses. Maximum UV protection. Protects against flying objects and other debris. Applications: Power Tool work; Sawing or Drilling Metal or Wood; Hammering; Overhead work. Frames adjust by pulling on extend bar in frame. Maximum UV protection and gold anti-fog indoor/outdoor mirrored lenses. Protects against projectiles & dust. Applications: Power Tool Work; Sawing or Drilling Metal or Wood; Hammering; Overhead work. Light weight frames with anti-fog lenses. Protects against projectiles & dust. Applications: PowerTool work; Sawing or drilling Metal or Wood; Hammering; Overhead work. Frames adjust by pulling on extend bar in frame. Maximum UV protection and Silver mirroring on tinted anti-fog lenses. Protects against projectiles & dust. Applications: Power Tool work; Sawing or Drilling Metal or Wood; Hammering; Overhead work. Frames adjust by pulling on extend bar in frame. Maximum UV protection and sky-blue anti-fog indoor/outdoor mirrored lenses. Protects against projectiles & dust. Applications: Power Tool Work; Sawing or Drilling Metal or Wood; Hammering; Overhead work. Light weight frames that adjust by pulling on extend bar in frame; maximum UV protection and mirrored anti-fog lenses. Protects against projectiles & dust. Applications: Power tool work; Sawing/drilling metal or wood; Hammering; Overhead work. Frames adjust by pulling on extend bar in frame. Maximum UV protection and sky-blue anti-fog indoor/outdoor mirrored lenses. Protects against projectiles & dust. Applications: Power Tool Work; Sawing or Drilling Metal or Wood; Hammering; Overhead work. Light weight indoor/outdoor frames. 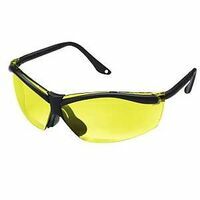 Maximum UV protection and anti-fog lenses; protects against projectiles & dust. Applications: Power Tool work; Sawing or Drilling Metal or wood; Hammering; Overhead work. Light weight frames that adjust by pulling on extend bar in frame; maximum UV protection and mirrored anti-fog lenses. Protects against projectiles & dust. Applications: Power tool work; Sawing/drilling metal or wood; Hammering; Overhead work. Frames adjust by pulling on extend bar in frame. Clear Anti-fog lenses that protect against projectiles & dust. Applications: Power Tool work; Sawing or Drilling Metal or Wood; Hammering; Overhead work. Glasses are tinted enough to take the edge off a bright day. These glasses have a light gold mirror finish on clear lenses, which makes them a great choice for bright, but overcast days too. Their dual-shot combination rubber and plastic temples also help improve comfort while reducing slippage on the nose. Featuring a special UV 400 lens additive, the lens blocks 99.999% of harmful UV radiation. Meets American National Standards Institute's ANSI Z87.1-2003 standard. Tough, polycarbonate lens provides impact resistance with 10 base curve lens provides maximum coverage and protection. Rubber tipped temples provide a secure comfortable fit. Soft, rubber nosepiece provides non-slip, comfortable wear. Overcast day or poorly lighted area, these glasses help brighten up the area your visual acuity is improved by wearing amber lenses with their anti-fog, anti-UV lenses, these glasses help keep the wearer's vision unobstructed. And the rubber-tipped, ratchet adjustable straight-temples improve style, fit and comfort. Meets American National Standards Institute's ANSI Z87.1-2003 standard. Anti-fog, scratch-resistant lens helps keep the vision clear, wide, flaired lens and rubber-tipped, ratchet adjustable straight-temples for fit and comfort. Meets American National Standards Institute's ANSI Z87.1-2003 standard. Contoured frame design; soft temple inserts; anti-scratch coating; meets the requirements of ANSI Z87.1-2003. Wide-wrap style safety sunglasses offer additional side protection without compromising style. Tinted glasses offer anti-fog and maximum UV protection, as well as defense against visible glare without color degradation. Safety glasses meet the Impact Protector requirements of ANSI/ISEA Z87.1-2010 and OSHA eye protection standards. Tough, polycarbonate lens provides impact resistance with 10 base curve lens provides maximum coverage and protection. Rubber tipped temples provide a secure comfortable fit. Soft, rubber nosepiece provides non-slip, comfortable wear. Slim, lightweight protective eyewear; dual mold rubber temples provide a secure, comfortable fit; polycarbonate lens provides impact resistance; soft, rubber nosepiece offers maximum all-day comfort; meets Z87.1 ANSI, UVA and UV8 99.9 percent protection. Slim, lightweight protective eyewear; dual mold rubber temples provide a secure, comfortable fit; polycarbonate lens provides impact resistance; soft, rubber nosepiece offers maximum all-day comfort; meets Z87.1 ANSI, UVA and UV8 99.9 percent protection. 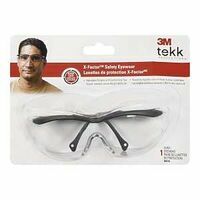 3M Safety Eyewear, Sports Inspired, Clear Lens, Anti-Fog? Lens Coating, Wraparound Frame, Black Frame, Adjustable Temple, ANSI Z87.1-2003, CSA Z94.3-2007, For Sports High impact resistant lenses with anti-scratch coating; soft, comfortable nose piece; flat temples provide a comfortable fit with earmuffs; lenses absorb 99% UV. Meets requirements of ANSI Z87.1. Soft, comfortable nosepiece; anti-scratch coating; limits risk of noise leakage when worn with hearing protection; meets requirements of ANSI Z87.1. High impact resistant lenses; soft, comfortable nosepiece; lenses absorb up to 99.9% of UV, UVA and UVB radiation; meets ANSI Z87.1-2010 requirements. High impact resistant lenses; soft, comfortable nosepiece; lenses absorb up to 99.9% of UV, UVA and UVB radiation; meets ANSI Z87.1-2010 requirements. High impact resistant lenses with anti-scratch coating; soft, comfortable nose piece; flat temples provide a comfortable fit with earmuffs; lenses absorb 99% UV. Meets requirements of ANSI Z87.1. Tough polycarbonate lenses for impact resistance; indirect vent ports prevent liquids from reaching eyes; protection against impact and paint spray, liquid splash, flying chips and dust particles. Meets ANSI Z87.1-2010 and OSHA regulations. The Dakura's flexible and durable black frame is equipped with soft TPR temple arms to create a comfortable, nonslip fit. Edge Eyewear is ANSI Z87.1+2015 and Military Ballistic MCEPS GL-PD 10-12 compliant and all lenses block 99.9% of UV radiation. The Dakura's flexible and durable black frame is equipped with soft TPR temple arms to create a comfortable, nonslip fit. Edge Eyewear is ANSI Z87.1+2015 and Military Ballistic MCEPS GL-PD 10-12 compliant and all lenses block 99.9% of UV radiation. The Dakura's flexible and durable black frame is equipped with soft TPR temple arms to create a comfortable, nonslip fit. Edge Eyewear is ANSI Z87.1+2015 and Military Ballistic MCEPS GL-PD 10-12 compliant and all lenses block 99.9% of UV radiation. High-impact resistant lenses; built-in side shields provide front and side protection; lenses absorb up to 99.9% UV, UVA and UVB radiation; meets ANSI Z87.1-2010 requirements. Enables attachment of a variety of Huntsman visors to your safety cap, (Cap Coil Spring Attachment). Huntsman locking device holds visor securely in the down position or up out of the way. Turn button visor attachment holds 12" or 15 1/2" visors securely, allowing for fast, easy visor attachment and replacement. Meets CSA Standards. The blade-style Zorge G2 has a flexible and durable black frame equipped with soft TPR nose pads and temple arms to create a comfortable, nonslip fit. The magnification readers are perfect for intricate work and viewing fine details. Edge Eyewear is ANSI Z87.1+2015 and Military Ballistic MCEPS GL-PD 10-12 compliant and all lenses block 99.9% of UV radiation. The blade-style Zorge G2 has a flexible and durable black frame equipped with soft TPR nose pads and temple arms to create a comfortable, nonslip fit. The magnification readers are perfect for intricate work and viewing fine details. Edge Eyewear is ANSI Z87.1+2015 and Military Ballistic MCEPS GL-PD 10-12 compliant and all lenses block 99.9% of UV radiation. Pinlock allows easy size adjustment; four-point, fully adjustable nylon suspension; large, pillow-padded sweatband for extra comfort. The Dakura's flexible and durable forest camouflage frame is equipped with soft TPR temple arms to create a comfortable, nonslip fit. Edge Eyewear is ANSI Z87.1+2015 and Military Ballistic MCEPS GL-PD 10-12 compliant and all lenses block 99.9% of UV radiation. Larger lens for more complete wrap around protection. Precise placement of inserts allows for distortion-free forward vision and increased safety when wearing. Enhanced nose piece design with integrated ridges to channel away sweat. Meets CSA. Includes: Free neck cord. Larger lens for more complete wrap around protection. Precise placement of inserts allows for distortion-free forward vision and increased safety when wearing. Enhanced nose piece design with integrated ridges to channel away sweat. Meets CSA. Includes: Free neck cord. Brim extends wide over the neck and ears, helping to reduce the amount of harmful UV radiation from the sun. Additionally, the brim is slightly shorter in the front, allowing the wearer to be able to look upward. This hard hat also features a ratchet suspension for quick and easy adjustment. Tough, polycarbonate lens is impact resistant and 99.9 percent UV protection. Distortion free lens provides fatigue free use. Full wraparound, rugged frame design fits securely. Rubber tipped temples keeps glass securely in place. Soft, rubber non-slip nosepiece provides maximum all day comfort. Six large cooling vents along the crown improve air circulation and comfort by reducing heat buildup. Patented easy-to-adjust ratchet design for added comfort and convenience. Special rain gutter along bottom edge helps reduce water dripping on neck. Low-profile and lightweight design for comfort over long periods. Lateral contours above the ear for easy integration of hearing protection. Patented "Glaregard" under brim reduces reflective glare from the sun. Super-soft absorbent sweatband for added comfort. The Dakura's flexible and durable black frame is equipped with soft TPR temple arms to create a comfortable, nonslip fit. Edge Eyewear is ANSI Z87.1+2015 and Military Ballistic MCEPS GL-PD 10-12 compliant and all lenses block 99.9% of UV radiation. The blade-style Khor has a flexible and durable black frame equipped with soft TPR nose pads and temple arms to create a comfortable, nonslip fit. The open lower frame prevents sight obstruction and allows lenses to be replaced easily. Edge Eyewear is ANSI Z87.1+2015 and Military Ballistic MCEPS GL-PD 10-12 compliant and all lenses block 99.9% of UV radiation. The blade-style Khor has a flexible and durable black frame equipped with soft TPR nose pads and temple arms to create a comfortable, nonslip fit. The open lower frame prevents sight obstruction and allows lenses to be replaced easily. Edge Eyewear is ANSI Z87.1+2015 and Military Ballistic MCEPS GL-PD 10-12 compliant and all lenses block 99.9% of UV radiation. The blade-style Khor has a flexible and durable black frame equipped with soft TPR nose pads and temple arms to create a comfortable, nonslip fit. The open lower frame prevents sight obstruction and allows lenses to be replaced easily. Edge Eyewear is ANSI Z87.1+2015 and Military Ballistic MCEPS GL-PD 10-12 compliant and all lenses block 99.9% of UV radiation. The blade-style Khor has a flexible and durable black frame equipped with soft TPR nose pads and temple arms to create a comfortable, nonslip fit. The open lower frame prevents sight obstruction and allows lenses to be replaced easily. Edge Eyewear is ANSI Z87.1+2015 and Military Ballistic MCEPS GL-PD 10-12 compliant and all lenses block 99.9% of UV radiation. High-impact polycarbonate clear visor that is easily attached and flips up. Ratchet suspension knob adjusts the size of the frame suspension to the user head for a custom fit. A soft padded brow pad helps absorb perspiration for added comfort. Faceshield and headgear meets all applicable high impact requirements of American National Standard Institute ANSI Z87.1. Use replacement visor 708.0344. Classic dual lens design provides 99.9% UV protection with built-in bifocal power; adjustable temple lengths and lightweight construction; meets ANSI Z87.1-2003, CSA Z94.3-2005 standards. Classic dual lens design provides 99.9% UV protection with built-in bifocal power; adjustable temple lengths and lightweight construction; meets ANSI Z87.1-2003, CSA Z94.3-2005 standards. Classic dual lens design provides 99.9% UV protection with built-in bifocal power; adjustable temple lengths and lightweight construction; meets ANSI Z87.1-2003, CSA Z94.3-2005 standards. Lightweight for all day wear, full side and brow protection, soft nosepiece for added comfort, polycarbonate lens provides 99.9 percent UV protection and meets ANSI Z87.1 and CSA Z94.3 safety standards. Universal slots accommodate hearing, welding and faceshield accessories. Comfortable six-point nylon suspension with cloth sweatband. Meets ANSI Z89.1, 2003 Type I, Class G, E and C Standards. The hard hat has a lightweight, rugged polyethylene hard hat shell, that is balanced on the head by the continuous loop nylon fabric suspension straps. Standards: ANSI Z89.1, Class e, CSA Z94.1-05 and Type 1. The sleek Reclus has a flexible and durable black frame equipped with soft TPR nose pads and temple tips to create a comfortable, nonslip fit. Silver accents on each temple add additional style to this classic design. Edge Eyewear is ANSI Z87.1+2015 and Military Ballistic MCEPS GL-PD 10-12 compliant and all lenses block 99.9% of UV radiation. The sleek Reclus has a flexible and durable black frame equipped with soft TPR nose pads and temple tips to create a comfortable, nonslip fit. Silver accents on each temple add additional style to this classic design. Edge Eyewear is ANSI Z87.1+2015 and Military Ballistic MCEPS GL-PD 10-12 compliant and all lenses block 99.9% of UV radiation. The sleek Reclus has a flexible and durable black frame equipped with soft TPR nose pads and temple tips to create a comfortable, nonslip fit. Silver accents on each temple add additional style to this classic design. Edge Eyewear is ANSI Z87.1+2015 and Military Ballistic MCEPS GL-PD 10-12 compliant and all lenses block 99.9% of UV radiation. The blade-style Khor has a flexible and durable black frame equipped with soft TPR nose pads and temple arms to create a comfortable, nonslip fit. The open lower frame prevents sight obstruction and allows lenses to be replaced easily. Edge Eyewear is ANSI Z87.1+2015 and Military Ballistic MCEPS GL-PD 10-12 compliant and all lenses block 99.9% of UV radiation. Consist of a polyethylene shell and suspension working together as a protection system. Polyethylene shell. Meets ANSI Z89.1 2009 for Type I helmets. Features a 4-point ratchet adjustment suspension for one hand adjustment; provides extra protection against the sun to help prevent ear and neck sunburn; meets ANSI Z89.1, Class C, E and G.
Reduces eye exposure to dust and debris; removable foam gasket. Meets requirements of ANSI Z87.1-2015. Brim extends wide over the neck and ears, helping to reduce the amount of harmful UV radiation from the sun. Additionally, the brim is slightly shorter in the front, allowing the wearer to be able to look upward. This hard hat also features a ratchet suspension for quick and easy adjustment. Consist of a polyethylene shell and suspension working together as a protection system. Meets ANSI Z89.1 2009 for Type I helmets. Consist of a polyethylene shell and suspension working together as a protection system. Meets ANSI Z89.1 2009 for Type I helmets. Impact and scratch-resistant lenses feature an anti-fog coating; provides 99% U protection; contains eyewear, bag and lanyard. Meets requirements of ANSI Z87.1-2015. Impact and scratch-resistant lenses feature an anti-fog coating; provides 99% U protection; contains eyewear, bag and lanyard. Meets requirements of ANSI Z87.1-2015. Protects face and neck against chemical splash and flying particles; crown protector is made of a high strength thermoplastic material impact resistant over a wide range of temperatures; window is made of tough polycarbonate and provides good heat resistance; meets ANSI Z87.1-1989 and complies with OSHA requirements. Sun Shield extends the brim all the way around to help protect ears and neck from sun rays. Made of polyurethane (front portion is Lexan,smoke tint). Hats not included with shields. Soft-touch nose and ear pieces; lightweight for comfortable, extended use; scratch-resistant, anti-fog coating; impact-resistant lenses absorb 99.9% of UV radiation; includes drawstring bag and lanyard; meets requirements of ANSI Z87.1. Soft-touch nose and ear pieces; lightweight for comfortable, extended use; scratch-resistant, anti-fog coating; impact-resistant lenses absorb 99.9% of UV radiation; includes drawstring bag and lanyard; meets requirements of ANSI Z87.1. Impact and scratch-resistant lenses feature an anti-fog coating; provides 99% U protection; contains eyewear, bag and lanyard. Meets requirements of ANSI Z87.1-2015. Flexible and resilient frames for a customizable fit; multi-injection technology fuses lens to the frame; impact-resistant lenses absorb 99.9 percent UV, UVA and UVB. The Brazeau's flexible and durable frame has foam nose pads that make these glasses easy to wear all day. Recessed lens cavities prevent airflow from drying out the eyes. Edge Eyewear is ANSI Z87.1+2015 and Military Ballistic MCEPS GL-PD 10-12 compliant and all lenses block 99.9% of UV radiation. The Brazeau's flexible and durable frame has foam nose pads that make these glasses easy to wear all day. Recessed lens cavities prevent airflow from drying out the eyes. Edge Eyewear is ANSI Z87.1+2015 and Military Ballistic MCEPS GL-PD 10-12 compliant and all lenses block 99.9% of UV radiation. The Brazeau Skull's flexible and durable black frame features a winged skull on each temple and has foam nose pads that make these glasses easy to wear all day. Recessed lens cavities prevent airflow from drying out the eyes. Edge Eyewear is ANSI Z87.1+2015 and Military Ballistic MCEPS GL-PD 10-12 compliant and all lenses block 99.9% of UV radiation. Includes 4 pairs; designed with polycarbonate lenses; lenses absorb 99.9% UV; meets the requirements of ANSI Z87.1-2010. Worn to help protect eyes against particles and airborne debris; durable, vented temples; adjustable nosepiece; anti-scratch coating; impact-resistant lenses absorb 99.9% UV; includes hard shell storage case; meets ANSI Z87.1-2003 standards. Streamline geometry with vented torsion lock temples for head hugging fit; meets or exceeds ANSI Z87.1 industrial safety standards; triple reflex coated for scratch resistance and extreme 99.9% UV protection; carrying case. Features clear, gray and mirror 3-pack; adjustable nose pads and soft-touch inlays increase comfort and provide grip; lightweight design; scratch-resistant, anti-fog lenses; excellent coverage and good field of vision; meets requirements of ANSI Z87.1. This thin rope is adjustable for a tight fit and is compatible with all Edge Eyewear styles. Durable vented temples; adjustable nosepiece; anti-scratch lens coating; impact-resistant lenses that absorb 99.9% UV, UVA and UVB. Innovative flexible design with wide temples to help with side protection and provide a more comfortable fit; made with the latest technology to help keep your vision clear; impact-resistant lenses that absorb 99.9% of UV, UVA and UVB radiation; meets the requirements of CSA Z94.1-2005, Type 1, Class C; includes microfiber storage bag and lanyard. Lightweight design for long-lasting comfort; impact and scratch-resistant lenses feature an anti-fog coating; provides 99% UV protection; contains eyewear, bag and lanyard; meets requirements of ANSI Z87.1-2010. Lightweight design for long-lasting comfort; impact and scratch-resistant lenses feature an anti-fog coating; provides 99% UV protection; contains eyewear, bag and lanyard; meets requirements of ANSI Z87.1-2010. Ratchet style suspension for use with "Skullgard" protective caps/hats and "Comfo" Cap protective headwear. Hat not included. Set includes 4 in 1 screwdriver, long nose pliers, steel shaft hammer, measuring tape, open end wrench, torpedo level and a zippered pink carrying bag. Polarized, tinted lenses help reduce glare reflected off of shiny surfaces such as snow, water sand and pavement. These safety glasses also offer 99.999 percent UV protection (UV 400). Stylish, tight-wrap design and soft rubber nosebridge. Safety glasses meet the Impact Protector requirements of ANSI/ISEA Z87.1-2010 and OSHA eye protection standards. The Dakura's flexible and durable black frame is equipped with soft TPR temple arms to create a comfortable, nonslip fit. The addition of a polarizing lens filter increases clarity by reducing glare. Edge Eyewear is ANSI Z87.1+2015 and Military Ballistic MCEPS GL-PD 10-12 compliant and all lenses block 99.9% of UV radiation. The Dakura's flexible and durable black frame is equipped with soft TPR temple arms to create a comfortable, nonslip fit. The addition of a polarizing lens filter increases clarity by reducing glare. Edge Eyewear is ANSI Z87.1+2015 and Military Ballistic MCEPS GL-PD 10-12 compliant and all lenses block 99.9% of UV radiation. The Dakura's flexible and durable black frame is equipped with soft TPR temple arms to create a comfortable, nonslip fit. The addition of a polarizing lens filter increases clarity by reducing glare. Edge Eyewear is ANSI Z87.1+2015 and Military Ballistic MCEPS GL-PD 10-12 compliant and all lenses block 99.9% of UV radiation. The Dakura's flexible and durable black frame is equipped with soft TPR temple arms to create a comfortable, nonslip fit. The addition of a polarizing lens filter increases clarity by reducing glare. Edge Eyewear is ANSI Z87.1+2015 and Military Ballistic MCEPS GL-PD 10-12 compliant and all lenses block 99.9% of UV radiation. Wide brim for protection against harmful UV rays. Excellent protection from rain, sun, heat and glare. 4 point nylon ratchet suspension. Meets ANSI Z89.1 standards. Class C, G and E. Wide brim for protection against harmful UV rays. Excellent protection from rain, sun, heat and glare. 4 point nylon ratchet suspension. Meets ANSI Z89.1 standards. Class C, G and E.
The aggressive Kazbek's flexible and durable black frame is equipped with soft TPR nose pads and temple arms to create a comfortable, nonslip fit. The addition of a polarizing lens filter increases clarity by reducing glare. Edge Eyewear is ANSI Z87.1+2015 and Military Ballistic MCEPS GL-PD 10-12 compliant and all lenses block 99.9% of UV radiation. The aggressive Kazbek's flexible and durable black frame is equipped with soft TPR nose pads and temple arms to create a comfortable, nonslip fit. The addition of a polarizing lens filter increases clarity by reducing glare. Edge Eyewear is ANSI Z87.1+2015 and Military Ballistic MCEPS GL-PD 10-12 compliant and all lenses block 99.9% of UV radiation. The aggressive Kazbek's flexible and durable black frame is equipped with soft TPR nose pads and temple arms to create a comfortable, nonslip fit. The addition of a polarizing lens filter increases clarity by reducing glare. Edge Eyewear is ANSI Z87.1+2015 and Military Ballistic MCEPS GL-PD 10-12 compliant and all lenses block 99.9% of UV radiation. High impact resistant ABS helmet; ventilation holes; rain gutter; durable stainless steel mesh visor; strong flip up and down function; detachable sun peak; articulated cap-mounted ear cups; height-adjustable ear muffs; NRR value 23dB; "Air Flow Control" technology for optimum and consistent noise attenuation and enhanced communication; snap-in comfortable ear cushions; ratcheting adjustment harness; head size 20-24.5" (50-62 cm); snug-fit harness and highly absorbent sweatband. Lightweight design. Sleek, popular styling with an economical price. Universal nosebridge for comfort and fit. Meets ANSI Z87.1+ Standards. 99.9 percent UV protection. Base curve: 9.5. Lightweight design. Sleek, popular styling with an economical price. Universal nosebridge for comfort and fit. Meets ANSI Z87.1+ Standards. 99.9 percent UV protection. Base curve: 9.5. The Brazeau's flexible and durable frame has foam nose pads that make these glasses easy to wear all day. Recessed lens cavities prevent airflow from drying out the eyes. Edge Eyewear is ANSI Z87.1+2015 and Military Ballistic MCEPS GL-PD 10-12 compliant and all lenses block 99.9% of UV radiation. The Brazeau's flexible and durable frame has foam nose pads that make these glasses easy to wear all day. Recessed lens cavities prevent airflow from drying out the eyes. Edge Eyewear is ANSI Z87.1+2015 and Military Ballistic MCEPS GL-PD 10-12 compliant and all lenses block 99.9% of UV radiation. Versatile fastening tool offers user multiple fastening options in a single tool design; traditional 8" adjustable wrench with laser etched SAE/MM scales and wide jaw opening; Pass-thru reversible ratcheting system works over long threaded rod where normal ratchets and sockets won't fit; every pass-thru socket replaces one standard and one deep; universal design fits 6 fastener types (hex, square, 12pt, E-torx, partially rounded hex, spline). Includes 10 universal combo sockets that fit both standard and metric fasteners: 3/8" (10mm), 7/16" (11mm), 15/32" (12mm), 1/2" (13mm), 9/16" (14mm), 19/32" (15mm), 5/8" (16mm), 11/16" (17mm), 23/32" (18mm) and 3/4" (19mm); sockets are clearly marked for easy identification; for pipe work, the jaw reverses. Simply back the jaw out, turn it around and re-insert. Serrations on the inside edge form a deep touch pattern that hold pipe tight and reduce slipping; corrosion resistant black-phosphate finish; packaged in a convenient storage tray. This black nylon cord is adjustable for a tight fit. The nylon tips fit all Edge Eyewear styles. This black and gray rope leash has an adjustable back for a tight fit. The neoprene tips fit all Edge Eyewear styles. This black stretchable sleeve is adjustable sleeve is adjustable for a tight fit and is compatible with all Edge Eyewear styles. Polarized lenses with anti-scratch coating; grooved two-tone design; adjustable nose bridge; dual-molded temples; includes microfiber storage bag and lanyard absorbs 99.9% of UV rays; meets ANSI Z87.1-2003 and OSHA standards. Contains a complete range of SAE and metric-sized sockets and 1/4", 3/8" and 1/2" drive tools forged from high-quality steel and finished in high-polish nickel chrome or black chrome; ratchet handles are ergonomically designed and have an easy-to-use, thumb-operated reverse-switch mechanism; sockets and extensions remain locked onto the drive until disengaged with an easy-to-reach, low-profile quick release button; Stanley sockets feature "Max-Drive" design, a unique radius corner design which helps reduce fastener wear by minimizing contact on the outer 5 percent of the fastener, helping to increase life expectancy and helps reduce slipping on frozen or rusted fasteners; meets and often exceeds ANSI specification; Includes: (30) 1/4" Dr. specialty bits; (8) 1/4" Dr. sockets; (1) 16' tape rule; (1) 18mm snap-off knife; (1) 1/4" Dr. bit holder; (1) 1/4" Dr. round head ratchet; (1) spinner handle; (1) claw hammer; (1) torpedo level; (1) 6" long nose pliers; (1) 6" slip joint pliers; (1) 2 pt Phillips screwdriver; (1) 6.5 mm flat screwdriver; (8) metric hex keys; (8) SAE hex keys and a blow molded carrying case. Pro forest helmet system. Includes: UV protected hardhat, adjustable 6 point suspension, hearing protectors, face screen, rain and neck protector, new high visibility orange color for improved safety, meets ANSI Z89,1-2003 class G-E-C standards. AVAILABLE TO REGISTERED HUSQVARNA DEALERS ONLY. (8) Metric hex keys; (8) SAE hex keys; (1) 6" Torpedo level; (1) 5M/16' tape measure; (1) 6" Diagonal pliers; (2) Screwdrivers; (18) sockets: 1/4", 5/32", 3/16", 7/32", 9/32", 5/16", 11/32", 3/8", 7/16", 4mm, 5mm, 6mm, 7mm, 8mm, 9mm, 10mm, 11mm and 12mm; (1) 6" Linesman pliers; (1) 3/8" drive Ratchet Screwdriver; (1) 6" Long Nose Pliers; (6) 2" Spring clamps; (1) 8oz. Fiberglass Claw Hammer; (1) 6" Slip Joint Pliers; (2) 4" Spring Clamps; (3) Driver bits/with 3 pcs bits holder and (1) Blow Mold case. Hardhat wearers can express their patriotism and protect their heads by wearing one of MSA's new special series of Freedom caps. The bright designs on the cap's .030-inch thick vacuum-formed glossy cover are very attractive and have a superior finish. Hard Hats meet all applicable requirements of the American National Standards Institute ANSI Z89.1-2009. Transparent with white elastic strap. Provides 99.9 percent UV protection; features: soft rubber nosepiece with flared ends and soft, rubber temples; includes neck cord; lenses are hard coated for scratch resistance; meets ANSI Z87.1 safety standards. Impact resistant and offers protection against falling objects and overhead hazards; equipped with MSA's comfortable "Fas-Trac" suspension; meets all applicable requirements for a type I (top impact) helmet as outlined in ANSI/ISEA Z89.1-2009 (class E) and CSA Z94.1-2005 (class E); meets the voluntary standard for reverse donning and low temperature (LT) as prescribed by ANSI/ISEA Z89.1-2009; third-party certified by the Safety Equipment Institute (SEI). Impact resistant and offers protection against falling objects and overhead hazards; equipped with MSA's comfortable "Fas-Trac" suspension; meets all applicable requirements for a type I (top impact) helmet as outlined in ANSI/ISEA Z89.1-2009 (class E) and CSA Z94.1-2005 (class E); meets the voluntary standard for reverse donning and low temperature (LT) as prescribed by ANSI/ISEA Z89.1-2009; third-party certified by the Safety Equipment Institute (SEI). Comfort-fit, nylon crown suspension straps; stylish painted look finish is permanently molded-on graphics; ratchet suspension for quick and easy adjustments; conforms to the American National Standards Institute's safety standards. Sleek and lightweight style. One-piece polycarbonate front with adjustable temples. Wrap-around protection. CSA approved available. Meets ANSI Z87.1 standards and base curve = 8. Provides 99.9 percent UV protection; features: soft rubber nosepiece with flared ends and soft, rubber temples; includes neck cord; lenses are hard coated for scratch resistance; meets ANSI Z87.1 safety standards. Sleek, sporty style with soft touch temples. Light weight construction and single lens wrap-around protection. 99.9 percent UV protection. Meets ANSI Z87.1+ standards. Sleek, sporty style with soft touch temples. Light weight construction and single lens wrap-around protection. 99.9 percent UV protection. Meets ANSI Z87.1+ standards. Includes: 3/8" drive, 1/4" drive ratchet handles, 1/4" and 3/8" x 3" extensions, 32 SAE and Metric sockets, 8 SAE hex kit set, multi-bit DuraDriver screwdriver and 12 bits, 12 SAE and Metric combination wrenches, hard case and wrap. Sleek, sporty style with soft touch temples. Light weight construction and single lens wrap-around protection. 99.9 percent UV protection. Meets ANSI Z87.1+ standards. This floater cord is designed to keep glasses close to the face without a hanging leash. 'Sweatbands' custom design fits all MSA helmets. Washable and has plastic snaps. Rubber nosepiece allows for all day comfort; 4-position telescoping temples for superior fit; lenses are hardcoated for scratch resistance; 9.75 base lens provides excellent optics and coverage; meets ANSI Z87.1 standards; provides 99.9% UV protection. Offers a sporty look on or off the job; a lightweight design and flex temples add an effortless fie; they also provide wraparound protection and come with a neck cord to keep them handy. Meets ANSI impact standards. 12 pair eyewear sidekick display contains model #s: DPG100-1D ("Dewalt Crosscut" safety glasses with clear lens); DPG100-2D ("Dewalt Crosscut" safety glasses with smoke lens); DPG101-1D ("Dewalt Auger" safety glasses with clear lens); DPG101-2D ("Dewalt Auger" safety glasses with smoke lens); DPG103-1D ("Dewalt Rotex" safety glasses with clear lens) and DPG103-2D ("Dewalt Rotex" safety glasses with smoke lens). Made of full polish chrome plating with sae/mm markings; meets or exceeds ANSI specifications. Includes: 1/4", 3/8", and 1/2" drive tools, (3) ratchets, (64) sockets, (2) extension bars, (8) wrenches, (55) 1/4" drive bits, (12) nut drives, (26) hex keys, folding case for easy storage and mobility. Features heavy-duty construction for use as head protection in steel mills and other heavy industries where elevated temperatures are common. Low profile, smooth crown helmet. May be painted. Outstanding thermal properties for areas with elevated temperatures. Meets ANSI Z89.1 2009 for Type I helmets. Applications: Agriculture, Asbestos Abatement, Chemical, Construction. WARNING: Do not mix suspension and helmet sizes. Make sure the sizes match (i.e., standard-size suspension with standard-size helmet). Use only MSA suspensions on an MSA helmet. Failure to comply with the above will reduce the energy-absorbing ability of the protective helmet, which can result in serious injury or death. Features heavy-duty construction for use as head protection in steel mills and other heavy industries where elevated temperatures are common. Low profile, smooth crown helmet. May be painted. Available in standard sizes. Outstanding thermal properties for areas with elevated temperatures. Meets ANSI Z89.1 2003 for Type I helmets. WARNING: Do not mix suspension and helmet sizes. Make sure the sizes match (i.e., standard-size suspension with standard-size helmet). Use only MSA suspensions on an MSA helmet. Failure to comply with the above will reduce the energy-absorbing ability of the protective helmet, which can result in serious injury or death.